Musically, I grew up a violinist, but I was always interested in technology and programming. I studied experimental sound practices at CalArts, and that gave me the time and space to experiment with combining my musical and technical interests. It’s taken shape in two branches: making installations and instruments (i.e. the bell controller) and improvising with a combination of violin, laptop, and synthesizer. 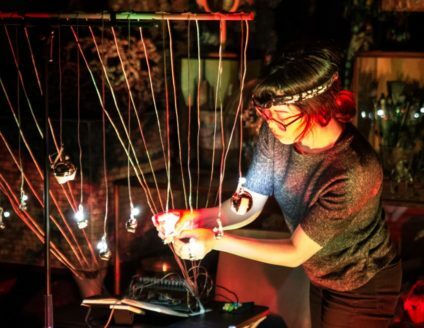 The instrument-making arose from building installations–I found that I enjoyed using the prototypes as instruments, so I started building performance-focused interfaces for them. 2. Who are some other musicians and/or artists you admire and why? Mark Trayle. He was my mentor and I performed in a few of his pieces. Seeing him work taught me that mistakes, technical mishaps and unplanned happenings are all a part of the process of art-making, yet Trayle’s work would still come out pristine and calculated. This had a profound effect on my own creative practice–to embrace mistakes, integrate problem solving into the piece, and to find new creative avenues through the cracks that are inevitable when creating new work. 3. What are you listening to these days? Usually whatever concert I’ve just attended. The latest one was Tim Feeney performing his record Burrow and later joined by Laura Steenberge, Mustafa Walker, and Jessika Kenney. 4. What is the strangest gig you’ve performed? I’m part of the Order of the Good Death, and we were featured in an Obscura Society event at the Mountain View Mausoleum in Altadena, CA a few years ago. I spent the evening performing a solo violin/synth set in a lovely hall of crypts, creating a soundscape that filled my corner of the mausoleum. 5. What is next for you? I’ll be performing with the bell controller, or something like it, as a part of PIE’s concert series on March 27th at Live Arts L.A. I’m also working toward a record release which will feature my work on violin and modular synthesizer scheduled for mid to late 2019 with A Wave Press. 5.5 Please pick a favorite or stand out clip/track from our archives and tell us why you chose it. Yoshi and Tashi Wada‘s Baldwin Hills Scenic Overlook concert. I attended this one in person, and the Overlook concerts are always a memorable experience. I’ve been a fan of bagpipes since I was kid, and I enjoy hearing and seeing them in less traditional settings, which doesn’t happen very often!